Why Does the Shower Curtain Always Try to Get Me? 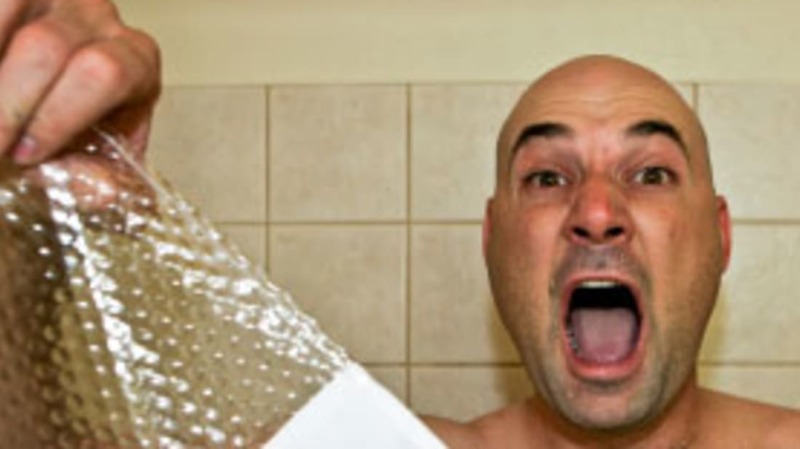 For those of you who take baths or are simply unconcerned with hygiene, let me explain the horror that is the “shower curtain effect.” You get in a nice hot shower first thing in the morning. You’re barely awake, but the womb-like confines offer the perfect space to transition from sleepy cretin to functioning human. Until, of course, the shower curtain – who you thought was your friend, who you thought you could trust – gives in to its strange, powerful attraction to running water and billows in towards you. On a good day, it’s a minor annoyance. On a bad day, it’s an unspeakable horror and the curtain actually, like, touches you. And it’s cold. And maybe even a little slimy. Why does the curtain do this to us? Great minds have been struggling with the problem for years, but until recently all anyone offered were hypotheses. Nobody ever actually tested these explanations and made the results public until a few years ago. That experiment gave us a pretty solid answer, but the theoretical work that came before it is pretty interesting, too. Let’s explore the small handful of different answers that have been suggested over time. We talked about the Bernoulli’s principle the last time I wrote about bathroom science. It states, basically, that an increase in velocity of a fluid (liquid or gas) results in a decrease in pressure around it. With shower curtains, the principle was thought to come into play like this: The water coming out of the shower head causes the air in the shower to start flowing in the same direction that it's traveling, which is parallel to the curtain. The air moving across the inside of the shower curtain causes the air pressure to drop, and the difference in pressure between the two sides of the curtain causes it to move in toward the lower-pressure area. For most of the time that people have been talking about the shower curtain effect scientifically, this has been the leading explanation. Warm air rises up and out of the shower. The air density in the shower is reduced and, like in the Bernoulli hypothesis, the difference in pressure between the shower and outside of the curtain makes the curtain move inward. The big problem with this hypothesis? The curtain still moves in even if you run an ice cold shower. Jearl Walker, a professor of physics at Cleveland State University who used to write Scientific American’s “Amateur Scientist” column, suggested that the Coand? effect, the tendency of a fluid in motion to adhere to a surface or vice versa, was at work. Now, these hypotheses are all well and good. They’re plausible explanations. One was even suggested by a guy who knows a thing or two about physics (and has put his hand in molten lava and poured liquid nitrogen in his mouth to demonstrate its principles). But they don’t mean much without data to back them up. In 2001, David Schmidt, from the University of Massachusetts, put his own hypothesis to the test and gave us the first evidence-backed explanation to every showerer’s pet peeve. To do the calculation, I drafted a model of a typical shower and divided the shower area into 50,000 minuscule cells. The tub, the showerhead, the curtain rod and the room outside of the shower were all included. I ran [the modeling software] for two weeks on my home computer in the evening and on weekends (when my wife wasn't using the computer). The simulation [which ran some 1.5 trillion calculations] revealed 30 seconds of actual shower time. When the simulation was complete, it showed that the spray drove a vortex. The center of this vortex, much like the center of a cyclone, is a low-pressure region. This low-pressure region is what pulls the shower curtain in… It is a bit like a sideways dust devil. But unlike a dust devil, this vortex doesn't die out because it is driven continuously by the shower.